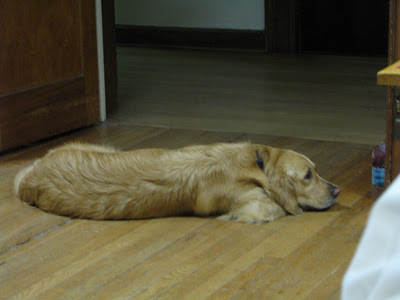 We are enjoying the beauty of this season of Lent with all that means for us: extra time for prayer, especially each Friday night when we don't have recreation.We refer to it as "Silent Recreation" which really makes no sense but we know what we mean! 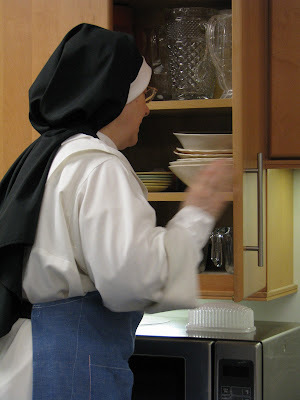 The fast and abstinence means that meals are more simple and dishes are done in a flash giving us all more time; in the afternoon this means a longer recreation time and in the evening this means sometimes as much as an extra half hour of study! Spring is here early and the birds have arrived proving the fact! Sisters are itching to get into the garden and here and there are trays of seeds starting! We're anxious for the ground to warm up a bit more to start tilling although that may be a problem this year as Sr. Mary Magdalene has been having a terrible time with our ancient tiller. Truly, it is very old as Sr. Mary Anthony's father gave it to us over 50 years ago. If you live in the area and find an old tiller that works collecting dust in your shed would you think of us? God bless you! This week we have some unusual guests with us—two young sisters of the Russian Orthodox Sisters of Mercy from the Convent of St. Elizabeth the Martyr located in Belarus outside of Minsk. The sisters have permission to go to various churches in the Diocese of Paterson to sell the beautiful items they make to support their convent and work of caring for mentally ill and developmentally disabled children and adults in various hospitals. 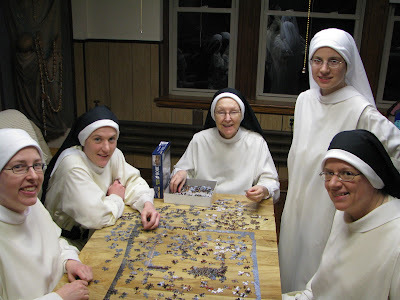 Their convent started in 1999 and now has more than 60 sisters. There are also nuns, brothers, deacons and priests. Last night we recreated together and the Sisters shared a DVD and their work and life. We were impressed at how centered on Christ is all their work. Of great importance is that the priests bring Holy Communion to the people in the hospitals. The Sisters shared with us that theirs is the only convent in Belarus. They work well with the Catholics which perhaps explained why they asked to stay with us. We are grateful for this sisterly exchange and pray that we may be one in communion: "that they may be one as you, Father, and I am one!" Every so often we go through a puzzling phase and right now we're in a double puzzle phase! In our consecration to Christ there is great joy in the simple, ordinary things of each day! 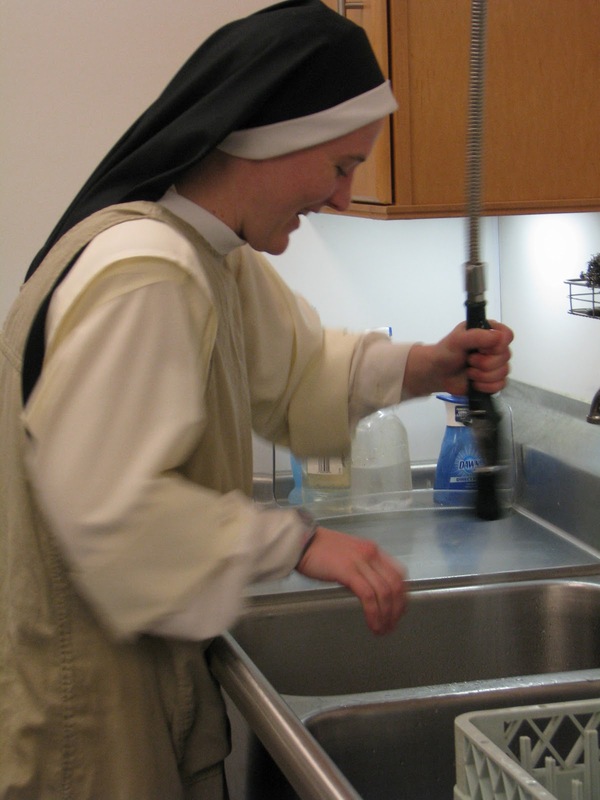 Sr. Mary Magdalene agrees that a clean sink is a most rewarding sight! Sr. Denise Marie tightens the hinges on the kitchen cabinet doors. 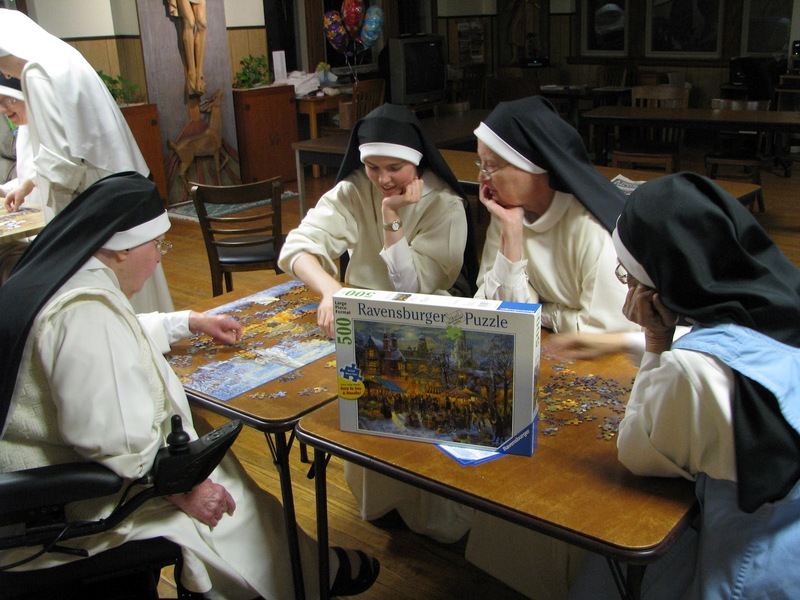 When those nuns get involved in a puzzle NO ONE gives me any attention! Seignadou Soaps To Be Featured On Fox News...along with the Nuns who make them!